A picture of our faith. There is a saying that states that “one picture is worth a thousand words”. How true that is on so many occasions. I first heard about the Bali explosions on the radio. The news reporter attempted to give a verbal description of what had happened and the devastation that had occurred in that otherwise peaceful and fun-loving place. However, it wasn’t until I turned on the TV and saw the pictures of the destruction, the stretchers and ambulances, the overcrowded hospital that the full extent of the situation really hit home. Those pictures described what thousands of words weren’t able to do. A couple of years when another driver attempted to remodel the look of my car by driving into while making a u-turn, I filled out a form for the insurance company. Included in this form was a space to explain what happened in words and another space to draw a diagram of what happened in the accident. The insurance company realised that often it is easier to draw a picture of what happened. Companies and churches have logos and if they are good logos they tell you something in picture form about that organisation. The Lutheran Church of Australia has a logo. On it you will see a large gold cross, the Southern Cross and flames of fire – that tells you something about the LCA – the centrality of the cross of Christ, the Spirit at work through the church and the location of the LCA. There is another symbol that is found in Lutheran Churches throughout the world. You will find this symbol on the front of church buildings and halls, you will find it included in the designs of the magnificent stain glass windows of Lutheran churches all over the place (including St Luke’s). You will find it in books and printed materials that are distinctly Lutheran in origin. I am talking about Luther’s Rose. Luther devised this logo as a summary of his faith. But not only of his faith but also that of all Christians. And so this logo is displayed in our churches as a picture of the Christian faith. You might say it is a sermon in picture form. Since today’s service is dedicated to commemorating the Reformation, it’s worth looking at it because it is a picture that will take a thousand words to describe this summary of our faith. Let’s start. At the centre of Luther’s logo is a cross. The cross of Jesus is at the every centre of the Christian faith. Without the cross, there is no Christianity. This cross is black in colour. Black is the colour of sin and evil – the darkness in our hearts and in the world that causes so much grief and pain. John’s Gospel says, “People love the darkness rather than the light, because their deeds are evil” (John 3:19). Black reminds us of our sinfulness. “Everyone has sinned and is far away from God’s saving presence” (Rom 3:23), the apostle Paul reminds us. Black is the colour of death – sin leads to death. When Luther was a young man he was nearly killed and the thought of dying terrified him. He was not ready to meet God the eternal Judge. And so he left all of his friends, his well paid job, his family, and wealth in his search of a way to get rid of his sin and be right with God. He entered a monastery and prayed, and fasted, and studied, constantly. But still his heart did not feel at peace with God. He always felt too sinful to ever be called into the presence of God if he were to suddenly die. He never felt confident that he would go to heaven. So he prayed, and studied, and fasted more. But the more he studied, the more he prayed, the more questions he had and the more doubts he had about how worthy he was before God. His sin and God’s judgement terrified him. It was fortunate for Luther that he was studying the Letter to the Romans and gained a fresh insight into 1:17: The righteous shall live by faith. He realised that a person cannot be made right with God by trying to impress God. Salvation is a gift of faith from God – faith that believes and trusts in what Jesus has done for him. Salvation is freely available to all. This was the answer to Luther’s searching and praying. He was elated. You cannot be saved without Jesus Christ. You cannot by pass the cross. Our sin is so great that it permeates and infiltrates every part of us, including every thing we say, do and think. It is impossible for us to step aside from our sinfulness for just one moment, and save ourselves, or dedicate ourselves to God, or give ourselves to God. Without God’s intervention, we would have no hope. And so at the centre of Luther’s Symbol is the cross. The cross is the symbol of God’s acceptance, his forgiveness, his grace. Yes, we are sinners, but by the free gift of God’s grace all are put right with him through Christ Jesus, who sets us free (Rom 3:23). Through faith in Jesus, our sins are forgiven, we are accepted by God, we are welcomed by our loving heavenly Father. In Luther’s logo the cross is placed on a red heart. Even though the cross is black, a symbol of sin and death and the shame that the Son of God had to die in such a terrible way because of our sin, the heart is red because it is a living heart. The gospel of forgiveness gives life. We have been saved, given life as children of his family, recreated, reborn, given a new heart to live as God wants us to live. The heart is a symbol of love. Not only the love that God showed in sending his Son, but for the love that flows through us. We have been renewed to love God with all our heart, soul, and mind, and to love our neighbour as we love ourselves. The red heart indicates that since we are God’s children through Jesus death on the cross, this has an effect on the way we live our lives. As God’s people, we should turn away from everything that is evil and sinful and let God’s love be evident in everything we say and do. Paul says, “You are the people of God…. So then, you must clothe yourselves with compassion, kindness, humility, gentleness, and patience. Be tolerant with one another and forgive one another …just as the Lord has forgiven you. And to all these qualities add love, which binds all things together in perfect unity (Colossians 3:12-14). A heart filled with God’s love is a busy, active heart. There is no room for complacency or laziness. Nobody receives the grace of God for private enjoyment. Nobody receives the gifts of God for private enjoyment. They are meant to be used to serve others. The red heart is resting on a white rose. The white rose has been connected with the coming of the Messiah. The Christmas carol: Behold, a Rose is growing of loveliest form and grace, etc. The rose is the flower that indicates joy in the midst of the thorns of life. And so the red heart and living the Christian life rests on the white rose. It is not easy being a Christian, a follower of Jesus in this day and age. it is easy to forget that we have been called by God to be in his family and to do his work. We fail often, we confess that we have not done what God has called us to do. That is part of the thorny world in which we live. But we experience the joy of the Good News of the Gospel, the joy of being renewed for service, and refreshed with sins forgiven and sent out again to do his work. For Luther, the rose was a symbol of this joy among the thorns of our world. Because of the joy of knowing Jesus, our service to others is filled with joy. If we served our Lord grudgingly, it would not be service. If we went unwillingly, or with a grumbling spirit, our service would not be worth anything. True service, true worship, true discipleship reflects the joy that we have because of Christ. What a joy to have a Saviour who loves us! What a joy to know that our sins are forgiven! What a joy to know that Jesus gives eternal life! What a joy it is to be called as Jesus’ disciples in this world to pass on that love and hope of eternal life! Everything about Jesus fills our hearts with joy. As Paul said: Rejoice in the Lord always. I will say it again: Rejoice! The white rose rests on a sky blue background. The sky-blue background of Luther’s logo reminds us of the promise of eternal life that we have through Jesus Christ. Because Jesus rose from the grave, we too shall share in the bliss of heavenly joy and we look forward to that day when we will be in heaven with our Lord and with all those faithful people who have gone before us. It may happen that our life takes a turn for the worst – persecution for our faith, tragedy, ill health, crippling old age, the loss of our ability to think clearly – but there is one thing that doesn’t change or decay. We look forward to entering heaven when this life is over. The sky-blue background reminds us that our life on this earth is for only a short time. We are here and then we pass away – not into nothingness or oblivion – but into the joy of eternal life. Around the whole logo is a gold ring around. Like a ring that has no end, likewise the joy of heaven has no end, it will go on into eternity. The ring is gold, one of the most precious metals, and so indicating that the promise of eternal life is the most precious of all. In fact, you might say, everything relating to our faith is precious like gold and we value it more highly than anything else in all the world. So there you have Luther’s Rose; a pictorial summary of the Christian faith. It is a symbol of a faith that is just as true and relevant today as it was in Luther’s time. How central is the Jesus in your life or is he somewhere around the edges? How readily have you accepted that Jesus has cleansed you from all your sin or do hang on to your guilt? How ready are you to give up your pet sins and obediently live as someone who belongs to God? How willing are you serve Christ through humbly serving others? How well are you sharing the joy of the gospel with others? How strong is your relationship with your Saviour – or is it a somewhat casual affair? How confident are you that when you die, you will go to heaven? Or is there some lingering doubt that you won’t be good enough? In what ways are you letting the love of Christ effect every relationship? Look at Luther’s logo again and see that Jesus, God’s love, a renewed heart and Christian service are central to everything that we do personally and as a church. Confess it, believe it and live it!! Loving God and one another. 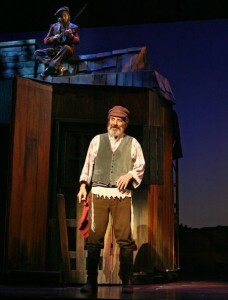 A production that I have seen performed by professionals as well as secondary school teens is Fiddler on the Roof. The play is set in an impoverished Russian village, Anatevka, populated largely by Jewish families, at a time when Russia was ruled by the Tsar. The people of the village had a simple faith. They heard little news of the outside world and their lives were governed strictly by their age-old traditions. As the curtain opens for the first act, the attention of the audience is drawn to the roof of a house on the stage. A violin begins a haunting tune and the shadow of a fiddler, violin tucked under his chin, is seen playing and dancing gaily on the roof. Every Pharisee, every Jew – even Tevye the dairy farmer in the village of Anatevka – knew those words. These words are the essence, the beginning and the ending of the Jewish piety. In Deuteronomy we read, “Hear, O Israel, the Lord our God, the Lord is one. Love the Lord your God with all your heart and with all your soul and with all your strength.” These words were to be recalled in the morning and in the evening. They were to be taught to the children. And they were recited just before the moment of death. The Pharisees wanted to find out where Jesus stood in regard to the traditional faith, the faith of the fathers. And in his reply, we find that Jesus had a great respect for tradition. He goes to the very heart of the Jewish faith and quotes passages of the Old Testament. Earlier in Matthew’s Gospel we hear that Jesus hasn’t come to do away with Israel’s faith. We hear him say, “Do not think that I have come to do away with the Law of Moses and the teachings of the prophets … but to make their teachings come true. Remember that as long as heaven and earth last, not the least point nor smallest detail of the Law will be done away with – not until the end of all things” (Matt 5:17). Jesus has great respect for the traditional faith, but not necessarily the traditional interpretation of the Pharisees. The Jewish idea of responsibility when it came to which people were to be loved went like this. Everyone was to love God – that was compulsory. But everyone else was given a rating as to how much love they were to receive. There were those people to whom it was a responsibility to show love. Those on the outer circles of the community, like lepers, sinners, tax collectors, Gentiles, Samaritans etc, some were to be loved less, or others were owed no love whatsoever. The Pharisees had established a multitude of laws to help people in their observance of this command. These laws told people whom they were to love, and whom they could ignore. By saying that the greatest commandment is to love God and to love your neighbour, gives a new slant to the traditional interpretation. To love God that was clear enough but to also say to love one another in the same breath puts both of these commands on an equal footing. One is not more important than the other. Both are compulsory. To love God is to love my neighbour and to truly love my neighbour is to love God. The command to love our enemies might seem to be crazy and impossible but it fits right in here with God’s love for us and our love for God. The Bible says, “If we say we love God, but hate others, we are liars. … The command that Christ has given us is this: whoever loves God must love others also” (I John 4:20-21). It’s quite clear that loving God and loving our neighbour are inseparable. You cannot claim to love God if you don’t love your neighbour. Essentially the entire law of God can be boiled down to two simple commandments: Love God with your whole being; and love whomever God puts next to you as you love yourself. Before we go any further we need to understand what Jesus means here when he uses the word love. That little four letter word “love” in English is used in many contexts. We talk about loving our dog, loving strawberries and ice-cream, or loving our latest heart throb. When we use the word love like that we are expressing our affection and the warm feelings we have for whatever it is that we are loving. Because we associate the word “love” with affection it’s no wonder that we have difficulty loving those people who annoy us, those who have hurt us, and those who don’t deserve to be loved. When someone is really annoying us and we lose that warm feeling, we give up “loving” that person. When the Bible talks about love it is really talks about a love that keeps on loving, it involves commitment. We may have warm feelings of gratitude to God when we consider all that he has done for us, but it is not warm feelings that Jesus is demanding of us. It is stubborn, unwavering commitment. It follows then that to love one another, including our enemies, doesn’t mean we must feel affection for them, rather it means a commitment on our part to take their needs seriously, just as God committed himself to taking our needs seriously by sending his Son into this world. You see this in marriages where the aging process leaves one partner physically incapacitated, difficult to live with, very demanding, and yet the other partner keeps on caring, showing patience, extremely forgiving and dealing with all the difficulties. That’s coming close to the biblical idea of love. It’s that commitment even though it’s really hard. It’s that stubborn, unwavering commitment to the other person’s needs often at a great sacrifice to him/herself. Whether we are talking about a marriage, involvement with a church or friendships – everything is fine while we have those warm feelings but when those warm feelings fade so does the relationship. You see, warm feelings without any commitment are very temporary. The kind of love that Jesus is talking about in his answer to the Pharisees doesn’t come naturally. Putting it into practice is something we have to work on. Love – commitment – is a deliberate action of the will. To love means deliberately to turn toward another person and their needs, to give away something of ourselves to someone else without thinking of what we will get in return. In Luke’s Gospel Jesus tells the parable of the Good Samaritan (Luke 15:25-37) we see an example of a man loving his enemy, committing his money, time and energy to seeing to the needs of the man lying in the gutter. He stopped to help and to hang with the consequences. All he could see was someone in need. This kind of love/commitment is self-sacrificing. It is putting the other person first, whether it is God or our neighbour. In all honesty, it doesn’t take much imagination to realise that this kind of love has been in short supply in our lives. In fact, if we could love perfectly then there would be no more sin in our world. If we could love perfectly, if we could be able to be truly committed to other people, then there would be no more violence, or war; what we say and do would only be gentle, kind and caring. Because this is not the case Jesus came to pay for our lovelessness. He showed us what true love is. His love touched the dumb, the deaf, the diseased, and the disabled. His love warned, wept, and washed dirty feet. His love willingly took him to Jerusalem and terrible suffering. His love carried a cross – and died upon it! His love welcomed each of us into God’s family, forgiving our sin in the water of baptism. Because of Jesus you are perfect saints in the eyes of God. Eternal life is yours in Christ. Forgiveness of sins is yours. The perfect love of God is yours. We don’t love in order to get to heaven; we love because heaven is already ours in Christ. We don’t love in order to win God’s favour; we love because we already have God’s favour in Christ. We don’t love so that God will love us; we love because God has loved us in Christ with the greatest love we will ever know, the crucified love of Jesus. 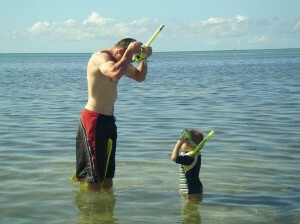 The other day I had the experience that many fathers have with their kids: I watched one of my kids imitate me. Right down to the gestures and the tone of voice. It reminded me that the most powerful way to teach anybody anything is to do it yourself. This is what you see at work in the second reading for today, from Thessalonians. Paul has been the founding pastor of this congregation at Thessalonica and has lived and worked with the people there for some time – certainly some months, perhaps even for a year or more. The church began in this Greek city of Thessalonica through Paul’s missionary preaching, and through the baptism of converts who came to believe as a result of this preaching. But Paul has done much more than preach. He has lived his faith. He has been Living the Word – a familiar phrase in the Ringwood congregation! And this is what has made the biggest impact. Interestingly, like parents with their kids, pastors often leave their imprint on a congregation – particularly pastors who stay a while. Over time, the people see and watch and pick up what the pastor’s attitudes and priorities are, and they adopt and imitate them. This is what happened with this little congregation at Thessalonica. Paul makes mention in his letter to them – written after his time with them – of two particular special qualities they have. In verses 5 and 6, he mentions their conviction and their joy as Christians. Somehow they have learned these things and are putting them into practice. Now, where, how and by whom do you think they saw those two qualities being lived out? Who showed them joy and conviction? Paul of course! They are imitating him. When he looks at the church in Thessalonica, he is looking in the mirror! During his time at Thessalonica, Paul shaped this church with his own values – so much so that after Paul left, they carried on in the way he had shown them. Paul’s great faith and conviction about Jesus Christ and his love for all people had rubbed off. They watched and they noticed and they imitated. In same way they had made Paul’s joy in the good news of salvation their own. So much so in fact, that this little church had become famous not only in their own area but in surrounding territories – in Achaia and Macedonia and even beyond. Paul observes that the word of the Lord has “sounded forth” from them and made a huge impact on people near and far, so that now others were being inspired by them and had begun imitating them. Paul’s great passion and enthusiasm for telling the world about Jesus Christ had powerfully shaped them and they were now shaping the faith of others. There’s a chain reaction here: Paul imitates Christ. The Thessalonians imitate Paul. And other Christians then imitate the Thessalonians. It is like throwing a rock into a pool – the ripple effect goes out further than we ever imagine and effects others in ways we never dreamed of. As I look at the life of this congregation (through the eyes of Christ) I see the same thing at work. Many people have grown and learned how to live out God’s love as they see others doing it. We learn Christ through seeing and meeting Christ in each other. There are small acts of service in response to peoples’ needs, there is understanding and gentleness given to those with problems in life, there’s care and encouragement. And others watch as this happens and then imitate. It is beautiful. We help one another grow in this way. But it’s not just inside the church that this happens. The ripples go out. As I look at families in our church, I see the powerful witness some of you parents give your kids by your own worship and service, especially the young kids who are still at home. When they see you worship and watch you sing and pray and see how this is part of your life, they are being formed in their faith. But it is also the same with you parents of older kids that have grown up and left home and possibly left the church. Don’t under-estimate the power of your example of faith and worship and love. Never think that it is not being noticed and having an impact. It definitely is, even though you may see no visible response to it now. What they see in your life is worth more than anything you say to your kids. This is fundamentally what “Child in Our Hands” is about – it’s what your kids see in you. There is of course an important role for teaching and instructing people in the Scriptures and the doctrines of the faith (Paul certainly did that at Thessalonica too), however the most powerful teaching was his example. What people see us do, what attitudes we display, what values we show. As Paul says, when this is happening, when the Holy Spirit is using us to lead and shape one another in God’s love, we often have no need to say a lot about it because our lives speak louder than words. One things lots of people in the church do not understand is that this is the mission of the church at work. The church works not through programs or buildings or spectacular attractional events or dynamic pastors – but through you – yes you, imperfect you, sometimes struggling you – because you are, by God’s grace, Christ’s child, his disciple. In the way perhaps that you do not judge others in their problems but listen to them. Things that you might not even be aware of doing yourself, but are things you do because they are just part of who you are in Christ, and it comes out of you. Some of you might know the story of Malcolm Muggeridge – a journalist and sceptic, who rejected the Christian faith. He was full of cynicism and ridicule about the Church and criticised it at every opportunity. As part of an article he was researching he visited one of the Hospices in India run by Mother Theresa (long before she became famous). He met her and interviewed her, and a life long friendship began. When he, a couple of years later was converted and became a Christian, he said that meeting Mother Theresa was the great turning point in his life. Why? Because of her example of Christian love and compassion. It was what she lived more than what she said. He had no arguments against that. He had no way of attacking it. He saw God’s power quietly at work in this woman. As he put it, in her eyes, he met Jesus Christ for the first time. In turn, Malcolm Muggeridge has influenced an enormous number of people towards Christ through his repentance and faith in Christ, and the way he has shared this in his writing and his books over the years. It’s that ripple effect again. A Christian fellow, who had previously been a devout Hindu inIndia, reflects on his former religion at a time when he decided his Hinduism would lead him to worship his cow. Cows are sacred inIndia. They are gods allowed to roam the streets, enter houses, and to eat them would be a crime of sacrilege. The Hindu honoured his cow; however, he began to question his faith when this god of his charged him. The consecrated cow, became a beast of burden, thinking nothing of the honour the Hindu had given him. I’d suspect it would make you wonder, what you’d done wrong, after giving much homage to the cow. Yet all you get in return is wild-eyed rampage coming at you to gore you for your trouble. Perhaps one should have fell prostrate seeking mercy from the cantankerous cow, but I must admit I’ve never witnessed too many farming folk from around these placed bowing low in the dust and filth of a cattle yard to earn the favour of a snotty animal that’s just been seared with a branding iron. No. The wise thing to do is let the adrenaline take over in super-human style and leap the impossible fence in a single bound. So the blessed bovine became a beast of burden. The Hindu knew his god of wrath was no god at all and after some time circumstances brought him before the God of creation and his Son, Jesus Christ. In time he believed and he became a Christian. This might seem like nonsense — worshipping a cow, not being able to eat them, believing they have divine powers. One might say it’s foolish or just a big heap of bull! But humans have been burying themselves in it from ancient times up until the present. The Israelites having been led out ofEgyptwith much power and supremacy by God himself, now sit in wait for Moses who had disappeared upMount Sinai. While Moses is before God, hearing what was to be put in place so God could have a personal relationship with the Israelites through the giving of the ten commandments and instructions for building a tabernacle — a footstool for God on earth, the Israelites put there own building plan into action. They built themselves an image and declare it to be God’s representative. What was taking time and preparation between God and Moses on the mountain was contrasted by the immediate rush down below for Aaron to dream up a golden image to take the place of an infinite God. For us this too might seem like a load of bull. They built an image of a calf, and covered with their gold. It was a personal creation of the people, but it was impersonal — unable to speak, see, or act. It could do nothing unlike the God of Abraham, Isaac, and Jacob, who had done everything for them in the past. However, the people had waited quite a while for Moses. They must have wondered if he was returning. The Israelite failed to see it was not Moses who brought them up out ofEgypt, but rather it was God using Moses as his mouthpiece and mediator. 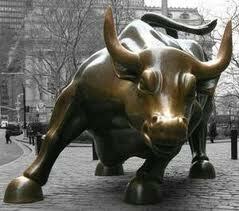 But why a golden calf? What has a cow got to do with God? Why did they make an image of a young bull as God’s representative on earth? The Egyptians and Canaanites saw the bull as an object of fertility and power and worshipped it as a representative of the sky or storm gods. The Israelites had just recently leftGoshenwhere they would have been accustomed to this style of worship. Bulls in ancient times were seen as the kings of domesticated animals, just as eagles were the kings of the birds, lions were kings of the wild animals, and the cedars of Lebanon were the kings of the trees. So God seemed to have become even more distant, now that there leader, Moses, had not been seen for some time. He had disappeared in the glory cloud of thunder and lightning on the mountain. Therefore a bull would have seemed a fitting image of God who was hidden in the Sinai storm of fire and smoke with such power and might. But we know that the whole exercise was a load of bull. 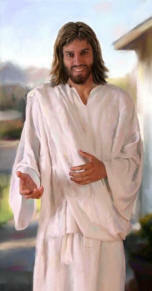 The glory of God and his personal relationship with the people ofIsraelwas exchanged for an impersonal idol. In fact they acted disobediently before God, who had commanded them not to make graven images out of gold or silver. They turned from the person of God Almighty to their own personal thoughts and created a god. They sinned against the Creator and became creators themselves and after they made their impotent god of gold, their self-glory sat them down in revelry against God. Worshipping living cows or golden calves might seem to us like a big load of bull. However, you and I too struggle with self-glorification. All of us create sacred cows in our lives and bow down to them. We do it wittingly and unwittingly, making gods of the created, and placing them above the Creator. The problem is that when we create these gods for ourselves, it’s just not they that are the gods. We worship them before God, placing our faith in them, because they have come from our own power. In fact, it is you and I who make ourselves god, when we place other things before God Almighty. In reality, we distant ourselves from the One True God with a pantheon of pseudo gods. We busy ourselves in service to them, so we don’t have to face the reality of our sinful nature before God Almighty. These gods in our lives are very impersonal. They take away our identity, further destroying the image of God which was originally intended for you and for me. Like the Hindu’s cow god, the gods we create end up charging us, becoming beasts of burden. They kill rather than give life. Like the golden calf our impersonal gods serve us by being a dead weight around our necks, dragging us down into darkness. Before we exchange the glory of God for our ideas about God we do well to remember the idolatry of the Israelites and the Hindu cow worshipper, was, and still is, a big heap of bull. Before we seek to implement our own ideas of what worship is all about, perhaps we need to hear and study the word of God, and hear what God has put in place for us. The glory of God is the God who saves us. The glory of God is he who names our sin, calls it to account so he might forgive it, so we might live in peace with him. The glory of God is he who feeds us with his Holy Word and embodies that word of peace and forgiveness in us through the bread and the wine, so we might bear the glory of God before the world showing that our own created false gods and idols are a big heap of bull. The Glory of God is Jesus Christ alone; who served us by bearing our sin on the cross; and continues to serve us in his resurrected glory. And that’s no bull! Amen. Jesus said, “There was once a landowner who planted a vineyard, put a fence around it, dug a hole for the wine press, and built a watchtower. Then he rented the vineyard to tenants and left home on a trip. When the time came to gather the grapes, he sent his slaves to the tenants to receive his share of the harvest. The tenants grabbed his slaves, beat one, killed another, and stoned another. Again the man sent other slaves, more than the first time, and the tenants treated them the same way. Last of all he sent his son to them. “Surely they will respect my son,’ he said. But when the tenants saw the son, they said to themselves, “This is the owner’s son. Come on, let’s kill him, and we will get his property!’ So they grabbed him, threw him out of the vineyard, and killed him. Lord, what do you want us to do? Even though the parable in today’s Gospel is story about judgement, it begins with a note of grace and generosity. A landowner planted a vineyard, improved it with a fence and watchtower. He set up everything nicely and now the property would start making money. He employed tenants to take care of his investment. They simply had to tend the plants, keep the weeds down, harvest the fruit, and make sure everything ran smoothly. The tenants had it made. They had a good job, security, steady income, job satisfaction, a roof over their heads, food on the table. Simply – this job was a gift. As time went on the workers started to think of the vineyard as theirs. They started to use words like “our vineyard, our crop, our tools, our money”. They resented the idea that the landowner should expect to get anything from their hard work. They shamefully bashed, and even killed, anyone whom the landowner sent to get what was his. The owner finally sends his own son. You might well ask, “What kind of father is this?” He knows how ruthless and violent these people are. He should call in the police to deal with these guys once and for all. But the landowner is always optimistic – always hoping that the tenants will change. It doesn’t surprise us to hear that the tenants kill the son too. The conclusion to Jesus’ story – the landowner has no rent, no honour, no servants and now no son and no vineyard. Jesus asked his listeners what they thought the landowner should do now. A bit of a silly question really! Kill those violent and wicked tenants. After all the landowner had been ever so patient and gracious, giving them chance after chance to realise that they weren’t the owners but tenants. We know that Jesus was talking about the people of Israel in this parable and how they had rejected God by beating and killing the prophets, and soon will beat and kill his Son. This parable had a special application to the church of Jesus’ day but we would be blind if that is all we could see in this story. God is the owner but how often do we act as if we are the owners. When you stop and think about it, we are tenants, not owners. In the broadest sense, everything we have is on loan from God. We sometimes imagine that we are owners. It’s clear from the very first pages of the Bible when God gave Adam and Eve the Garden of Eden, that they didn’t own it, they were tenants. You are made and owned by God. Your life is not yours to own like you own a Holden or a Ford or a wide screen surround sound digital TV system and so you can do whatever you please with it. You’re God’s property. Life is a gift, just as the Holden or the Ford and wide screen surround sound digital TV system are gifts, to be used with God the Creator in mind. We have a responsibility to use his gifts wisely and faithfully. And God gives his gifts in the hope of finding a harvest of fruit – fruit like honouring, loving and trusting God above anything else, and in our dealings with others – love, joy, peace, patience, kindness, goodness, faithfulness, humility and self-control. Jesus was talking to the church of his day through this parable and so I want to focus on that special gift that God has given to us – the church. Like the landowner he has generously and graciously given us the church to care for and to reap a rich harvest. the church is the fellowship of believers who are loved by our heavenly Father who speaks to us through the Scriptures and shows us his love through the water of baptism, the body and blood of Jesus in Holy Communion. As God’s people we are given the Holy Spirit to encourage and support us every moment of every day. He keeps us together in Christ through forgiveness and reconciliation. The church consists of people who have been chosen by God – as Peter says, “You are the chosen race, the king’s priests, the holy nation, God’s own people”. The church is a gift and our place in the church is a gift from God. Since the church is God’s gift to us shouldn’t we be asking, “What does the owner want us to do? What does the Lord of the Church want us to do? As those who belong to the church through the gracious invitation of our Lord, what does he want us to do?” (Let’s not just think of the church as an organisation – like St Paul’s) but also of what does the Lord want us– the people of the church – you and me – to do). What does God want to do for this community through us, his church? What does God wants us to do to help and encourage those who are facing tough times – whether they are the result of their own making or just happen because they are part of fallen humanity. What does God want us to do to make worship meaningful across all generations? What does God wants us to do so that all children are taught about the love Jesus has for them? What does God wants us to do in order to make the best use of the properties and facilities that he has given us to further his work in this community? and as individuals you and I may have to change our ideas and that means not always getting our own way. If we, as church, still don’t know what God wants us to do we need to listen to him care fully again with open minds and pray all the more earnestly about it. The church is God’s. We can take heart. Being the church is not all left up to us. We are God’s church, God’s people filled with the Holy Spirit to struggle with us and guide us as we seek ways to actively be the church in the world. I said in the beginning that this parable of Jesus is a parable of judgement. Jesus concludes by saying, “And so I tell you, the Kingdom of God will be taken away from you and given to a people who will produce the proper fruits.” Was Jesus only talking about the church of his time? Could he also be saying this to us today? Is it possible that the church, the gospel, this gift may be taken from us and given to others? As a family drove into town town, they passed by a large, impressive church. “We’ll go to that church on Sunday,” the man said to his family. On Sunday they got up, got dressed, and walked to this very impressive church building. When the family entered they saw a small group of people scattered around the empty pews mumbling their way through the service. Jesus told this parable about the wicked tenants to bring the church of his day to repentance. It has the same effect on us today. When we read this we realise how often we forget to ask, “What would the owner want us to do”? We realise that so often we have wanted our own way and not sought what was the will of Lord of the Church.